Rustic dining tables from LodgeCraft in Eureka, Montana! 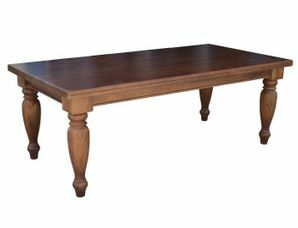 We have the finest section of indoor and outdoor rustic dining tables available anywhere. For over 24 years, LodgeCraft has been building our own line of handcrafted furniture, and we have furnished homes as well as commercial sites all over the USA and Canada. Choose from a full line of materials and finishes, including pine, alder, hickory, reclaimed wood, exotic hardwoods, and more in a huge variety of sizes and dimensions. Indoors or out, trestle, pedestal base and four legs, round, oval, and rectangle, we have the perfect rustic dining table for your home right here at LodgeCraft. We even source locally! Many items in our Flathead Valley store are handmade of timbers from around the area. To learn more about our indoor and outdoor rustic dining table selection, come visit our showroom in Montana or give us a call. We look forward to helping you find the perfect table!